KIEV, Ukraine -- It has been a year since President Viktor Yanukovych refused to sign Ukraine's EU Association Agreement, unleashing the Maidan Square street protests in Kiev that led to his ousting. Staff at MacPaw, a Kiev-based Apple app developer, hope the new government's pro-EU stance pays dividends quickly. His replacement, President Petro Poroshenko, signed the agreement in June. Amongst other things, it calls for a free trade area in the next decade, steps towards visa-free travel, and Ukraine to adopt EU regulations and standards. So what does all this mean for Ukraine's vibrant tech sector? Dmytro Kostyk, owner of Interactive Restaurant Technology, says fewer trade tariffs will help Ukrainian hardware companies importing and re-exporting components. Software companies, on the other hand, will see less of an impact. "The biggest problem for any high-tech start-up in Ukraine is intellectual property," he says. Ukraine's legal system does not provide enough protection, he argues, so many companies register in Delaware or Nevada in the US, as well as in their home country, to put their patents under the protection of Western laws. If Ukraine were to adopt more EU legal standards, tech firms would benefit, says Mr Kostyk. Viktoriya Tihipko, managing director of investment company TA Venture, agrees, arguing that harmonising Ukrainian and European law could also help tackle corruption and make life easier and safer for tech entrepreneurs. "[Ukrainians] gave their blood for the agreement," says Eveline Buchatskiy, managing partner of start-up incubator EastLabs. "They saw the EU as an external auditor that would save them from themselves." The agreement could speed up improvements to the country's IT infrastructure, she believes, because it commits both sides to building an "information society". Improving the speed and availability of broadband internet and rolling out 3G mobile connectivity would be of significant benefit to the country. Ukraine is a "sleeping IT tiger", she says, that could benefit from the successful e-government reforms enjoyed by other post-Soviet nations, such as Estonia and Georgia. The agreement's impact "is more psychological", says Andrey Kolodyuk, one of the founders of the Ukrainian Venture Capital and Private Equity Association (UVCA) formed by tech investors in August. But in his view, tech entrepreneurs would benefit greatly from visa-free travel. "They travel a lot, and every time they go to different countries, to take a visa, it takes a lot of time, money and process," he says. The founders of the UVCA envisage the association becoming the "front door" for foreign investors interested in backing Ukrainian ventures. June also saw the start of a new tech angel network, UAngel, led by veteran technology investor Jaanika Merilo. "Amid the political tumult, there is a paradoxical revival of the Ukrainian high-tech sector," says Adrien Henni, chief editor of Ukraine Digital News. Investors would appear to be hammering at Ukraine's door. Sir Richard Branson is one, through his involvement with the Brain Basket Foundation, a body aiming to train 100,000 new IT professionals in Ukraine by 2020. Despite the political turbulence in Kiev and war with Russian-supporting separatists in the East, new investment in tech companies continues to pour in. "It's very important because we've got new fresh capital, new fresh people coming into this sector," says Mr Kolodyuk. European investors and trade officials have not been deterred from visiting Ukraine's west - Mr Kolodyuk sees two or three European delegations each week. "No-one is afraid, people are coming here - they understand nothing [bad] is happening in Kiev," he says. He points to Israel as an example of a country where civil unrest and war have not prevented a flourishing tech sector. But other tech companies hope the benefits of the EU Association Agreement will be felt quickly. 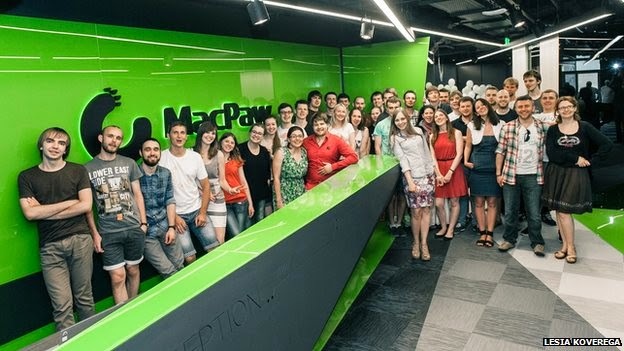 "I do hope that Ukraine is regarded as a priority partner from the European perspective," says Oleksandr Kosovan, head of MacPaw, a Kiev-based Apple app software development company. "The price Ukraine has paid - and is still paying - for it is drastically high." One surprise is that Russian investment in Ukraine has not dried up despite rising tensions between the two countries. Russian investors have been significantly involved in four of Ukraine's five largest start-up investment deals this year, says Yevgen Sysoyev, managing partner of AVentures Capital. These include April's $3.25m (£2.1m) investment in data storage and virtualisation developer, StarWind Software. Other Ukrainian start-ups receiving significant Russian roubles this year include bus-ticket software developer Gillbus, web-to-print developer Keen Systems, and Settle, a service for paying bills in cafes. Domestically, Ukraine's oligarchs, who lost control of some of their enterprises this year and had property destroyed, have been investing in mature IT projects but avoiding start-ups as too risky. It is the scale of corruption in Ukraine, not civil conflict in the East, that deters foreign investment, argues Dmitry Shimkiv, Microsoft Ukraine's general manager. An active participant in the Maidan revolution, Mr Shimkiv was appointed deputy head of the presidential administration in July, with particular responsibility for administrative and economic reforms. In August, he released a list of 14 priority areas for reform in the tech sector. These included: simplifying obtaining permits and licences, opening a catalogue of applications for registering intellectual property rights, and permitting Ukrainian nationals to open companies and bank accounts abroad without a licence from the National Bank of Ukraine. The parliamentary elections at the end of October also returned for the first time five new members from tech sector backgrounds, who will press for reform from within the legislature. Victor Halasyuk, chief executive of Bionic Hill innovation park, warns that Ukraine continues to suffer its own brain drain, given that there are about 900,000 unfilled IT vacancies across Europe. Without more subsidies or tax breaks for research and development, Ukraine risks becoming a "world university", says Mr Halasyuk. Reforms are necessary if this recent investor and start-up activity is to translate into growth, he believes. But UVCA's Mr Kolodyuk is optimistic. "Not only because of Shimkiv and people in parliament," he says, "but [because] there is understanding on a government level that, with new deals closing every two or three days, IT could be what changes Ukraine's perception abroad in terms of investment." As Maidan turns one, Ukraine's future now lies with Europe - with the tech sector leading the way in attracting new investment from within the EU. But with Transparency International listing the country as the most corrupt in Europe in the last Corruption Perceptions Index, the obstacles to reform remain substantial.